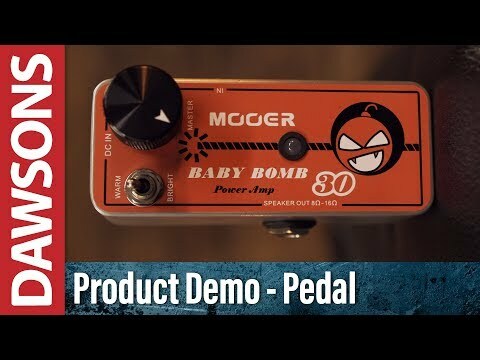 The Mooer Baby Bomb Micro Power Amp guitar pedal is a compact solution for the gigging guitarist. Packing 30 Watts of power into a tiny enclosure this pedal will drive any guitar cab with an impedance of 8 to 16 Ohms and is designed to be a compact, lightweight replacement for the Power Amp in your rig. With the Mooer Baby Bomb Micro Power Amp, you get a simple interface with which to manage your onstage sound. Featuring just two simple controls the Mooer Baby Bomb is easy to setup and adjust. The Master volume knob controls the amount of output as you'd expect, nudge it past 12 o'clock and you get a warm, tube-like post stage overdrive with natural tones. The additional toggle-switch gives you the option for Warm or Bright to increase or decrease the presence provided by the pedal. The Mooer Baby Bomb has a tiny footprint so can be housed anywhere on your pedalboard, great for the travelling musician who wants to keep things light. This pedal requires a 24V, 2A power supply and has your usual 1/4-inch jack inputs and outputs you can connect to any guitar cabinet, so long as it has an impedance of 8 to 16 Ohms.